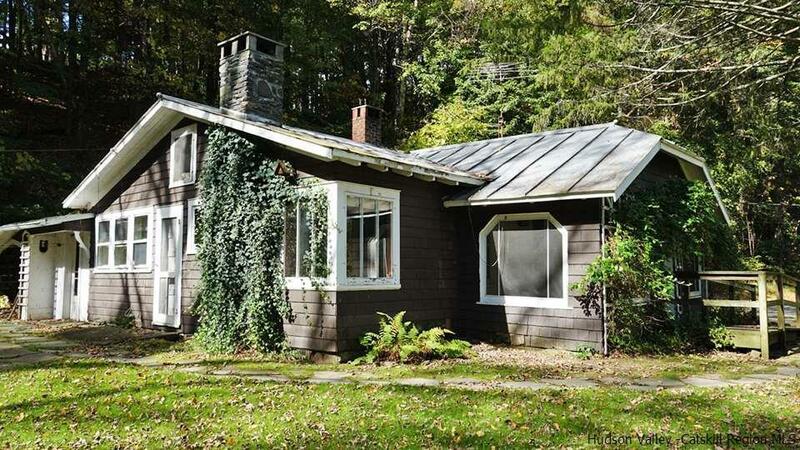 Charming 1920s bungalow in sought after Bearsville location is just waiting for your vision. This completely private home is set well back from Rose Lane, with mountain views and the Sawkill stream at the bottom of the property. Enter this magical home through the sunny screened porch with bluestone floor and double dutch door, into a beamed living room with fireplace and built ins. The bright, spacious kitchen has ample wood cabinetry and overlooks the stone patio. There are three bedrooms and one and a half baths, and a laundry room. There is an amazing separate garage with sliding barn doors, workshop, and room for both cars and storage. Str4oll down the grassy hill to the inground concrete pool, and the Sawkill beyond. Cottage gardens surround the house, and further views are possible with clearing. This is an unbeatable location and value, close to the center of Woodstock yet in a world of its own.